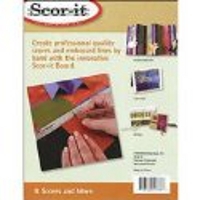 The Scor-it Tool is one of my great finds for a simple and easy to use Scrapbooking Tool. The Scor-it tool - is great for working with card stock that you wish to fold, impress, emboss or deboss with a straight line, or multiple lines to form designs. You can think of this as a Heavy Duty Bone Folder. 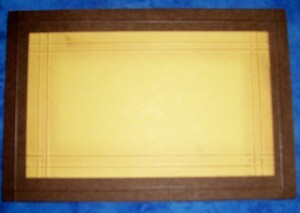 This Score it tool is just a little larger than 12 x 12, and will handle a 12 x 12 sheet of paper or card stock very nicely. 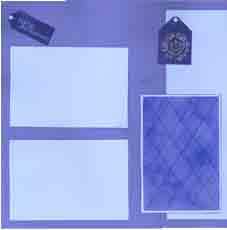 They also make a 24" and 36" board as well as a smaller mini-board 9" x 6" which is great to take to crops and also for card making. There is a centering ruler bar across the top with the "0" inch mark in the center making it very easy to position your paper for a score down the middle. Down the center is a scoring bar that makes the score as the tool is moved down from the ruler bar. The black portion is a textured rubber matting that will assist with holding your paper or card stock in place while scoring. The scoring tool itself is attachable to either the right or left sides of the ruler bar with a ball chain and there is also a Stop Guide that attaches to the ruler bar that is wonderful if you want to make a number of scores the same distance apart or the same distance from the edge of your paper stock. 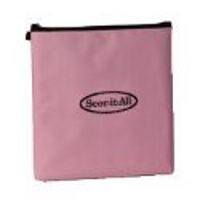 Scor-it Tool is now available in Pink! The Pink Version of the Scor-it now comes with a new hand held scoring tool made from Stainless Steel and Chrome. The Mini-board is now large enough to accommodate the new A-4 Card Size and the Centering Ruler at the top is now inter-changeable from inches to centimeters with a small Phillips Head Screwdriver. 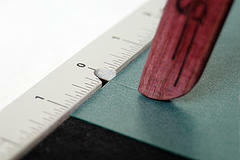 To use the Scor-it, position the paper stock squarely against the ruler bar at the top. The right side of the paper should be face down and the indented line the tool makes should be the "outside" of the fold. Hold the scoring tool in your dominant hand like you would a pencil, while holding the paper stock in place with your other hand. Position the groove in the hand-held tool over the bar at the top and glide the tool down the paper stock over the bar which will make a score line from the underside. You may want to test a few scores to see how hard you need to press down when scoring. This paper crafting and scrapbooking tool does exactly what it's supposed to do and is quite easy to use for very professional results. Currently available are padded tote bags for the original 12 inch and mini Score-It in pink and black, both with zipper closure to help keep the Hand Tool and Stop Guide. Cost is about $9.00 for the original 12 inch size and about $5.00 for the mini size. 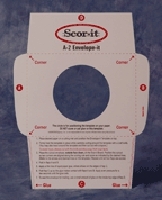 There is also the Scor-It Envelope Maker, an A-2 Envelope Template, an aluminum template that guides you to make A-2 envelopes from any sheet of paper. The A-2 card that measures 4 1/4 x 5 1/2 folded and holds an A-2 or invitation card that is 4 x 5 1/4. It has a cutout circle in the center that will allow you to position the template so you can see what the front of your envelope will look like. Great if you are using printed paper, to make sure you have the design you want centered on the front of your envelope. Made from aluminum, you can either cut around the template with a craft knife or you can trace around it and then cut out the envelope with a pair of scissors. 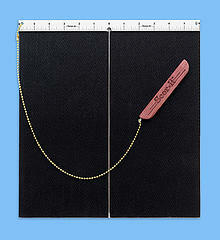 Also available is a Sliding Ruler. 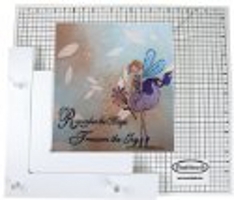 It slips onto the 12 inch large Scor-it Board and allows you to create dry embossed diamonds, rectangles, grids and starbursts. 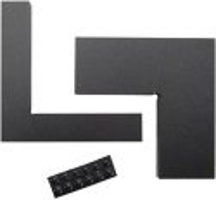 It has inch and metric measurements and fits both large inch and metric Scor-it Boards. 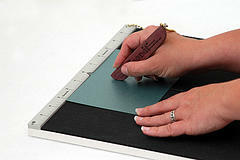 Just released now is the Scor-Grip, a great removable handle for your large stamps or acrylic blocks. Sometimes when you have a large stamp or block that is just too big to hold comfortably or securely in one hand, wouldn't this Scor-Grip be a great addition to your stamping workshop? The latest accessory is Cathie Allen's Position-It. This is the most complete and versatile stamp positioner on the market. It Comes with a solid base with grid, a main positioner with a peg system to hold it and your work piece firmly in place, a 1" sub-positioner, a clear plexiglass sheet, good instructions and non-slip feet. In addition there are Cathie Allan's Sub-Positioners, a 1" and a 2" Sub-Positioner that allows you to move further into your work or can work as positioners on their own without the Scor-It. Below are some examples of what you can do with the Scor-it and then scrapbook layouts using the results. The first blue card on the left was scored every 1 inch, going across and up and down the card. Then the score lines were inked by dragging a blue ink pad directly across the paper. The layout below uses that card. 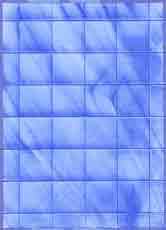 This will be a matte for a photo or a matte for a journaling block. And below, the card on the left was done the same way and then the corners cut off at an angle to make the scored lines appear diamond shaped. The scored lines were inked with a darker blue ink pad to accentuate the scored lines. This scrapbook layout may use the card for a photo matte, but the idea behind this was to put on some small flower embellishments to make it look like a floral trellis. 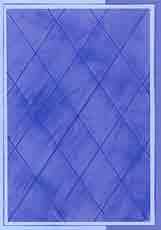 It could also be used to resemble a French Notice Board, with the scored lines replacing the ribbons. One last example is this card that was scored with double lines 1/4 inch apart. The scored lines were then lightly inked with a brown ink to accentuate them. The card was then matted with a brown card stock that was also scored 1/4 inch from the edge. 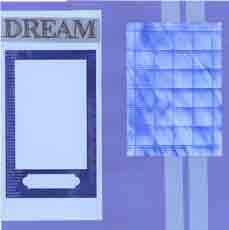 Use this as a Title Block, Journaling Block, Photo Matte or for the front of a greeting card. You can check out the Scor-it Tool website at Scor-It-All where they have a video from Craft TV weekly which shows the tool in action. There are also some suggestions for using the Scor-it Tool with other media like metallics, plastics, etc. Also available is a list of stores that carry the tool for purchase. Or you can check out the Score Store below for several brands of scoring tools.